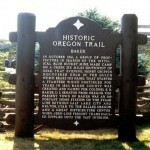 Subject: Baker City is recognized for its place in the early transportation system for gold discovery. In October 1861, a group of prospectors in search of the mythical Blue Bucket Mine, made camp on a creek six miles southwest of here. That evening, Henry Griffin discovered gold in the gulch which bears his name. That started a stampede which continued for years. In 1862, Baker County was created and named for Colonel E.D. Baker, U.S. Senator from Oregon. The present town of Baker was an important Home Station on the stageline between Salt Lake City and Kenton, Utah to The Dalles, Oregon, and a great distributing center when jerk-line freight teams hauled supplies into the vast interior. What is a jerk-line freight team?